Aillea Beauty is set to open in Atlanta on September 22 in the Powers Ferry Square retail complex. 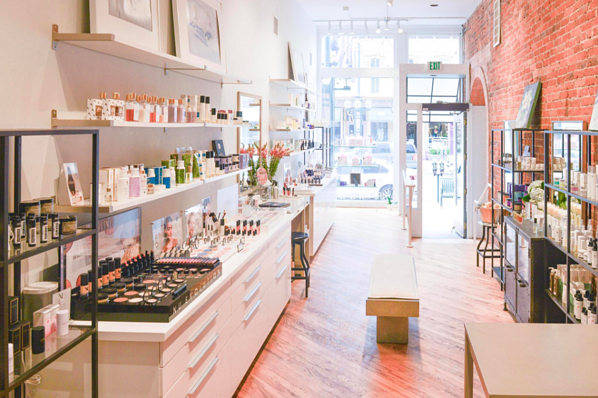 Designed for a quality customer experience in a well-lit, inviting space, Aillea Atlanta will fill its 600+ SF store with more than 45 high-demand, natural beauty products from leading clean cosmetic brands including Suntegrity, Rahua, Indie Lee, and Maya Chia. Well and Good identifies Aillea as one of the nation’s top natural beauty stores, citing 8-free nail polishes and mineral-based sunscreen as high on shoppers’ clean beauty routine lists. The global rise in natural beauty products has opened doors for entrepreneurs in the U.S. desiring to bring fragrance-free, mineral-based cosmetics to an evolving marketplace. Former beauty industry executive, Kathryn Dickinson grew frustrated with false claims of clean products and started her own company. Aillea Beauty is aimed to be a “safe haven” for women to find trustworthy, safe and effective skin care and beauty products. According to Business of Fashion, the success and continued growth of industry leaders like Aillea Beauty reflects the evolution of safe, wholesome beauty movement marred by previous imitators. Sarah Brown, Business of Fashion contributor, identifies a new set of questions that is creating a new demand for trusted natural beauty products like the kind Aillea offers. Brown says retailers must ask themselves hard questions like, What’s in our products? How were they made? Who do we trust? What can we believe? What’s marketing, and what’s legit? What is the law? This trend reverberates among specialty stores and large retailers alike, including Bloomingdale’s and Target. WWD reports on Bloomingdale’s new Glowhaus Concept, which the company expects to appeal to millennials, and will offer 800 products from 30 brands. However, big stores are encountering challenges when trying to get shoppers into the natural beauty aisle. Smaller stores like Aillea that make natural products their focus provide an easy way for shoppers to find what they need and get product support from store associates.